Heather Sayine-Crawford is the Manager of Wildlife Research and Monitoring for the Sahtu region within Environment and Natural Resources (GNWT). Born and raised in the NWT, Heather began working with ENR in her home town of Fort Smith as a biologist intern after graduating from the University of Alberta. In 2010 Heather moved to the Sahtu as a regional biologist. After some time working with a diversity of researchers and animals, Heather decided it was time to pursue her Master’s degree in wildlife management, she took some leave from the Sahtu to study Dall’s sheep population dynamics at Montana State University. The diversity of work, the interactions with friendly, knowledgeable people and the awe-inspiring landscapes keep Heather thankful for such an amazing career. Most of Walter Bayha’s early years on Mother Earth were spent out on the land with all of his grandfathers, travelling and learning the Dene traditions of Sahtú (Great Bear Lake) in the Northwest Territories. After thirty-two years in the resource development field with both the Federal and Territorial governments, he switched to the working with Aboriginal governance organisations. Walter is currently Manager of Lands and Resources with the Délı̨nę Land Corporation. He is a senior adviser to the Délı̨ne First Nation Chief on caribou issues and language programs. He has served as Implementation Director for the Déline Governance office, Chair of the Sahtú Renewable Resources Board, member of the Sahtu Land and Water Board, and member of the Mackenzie Land and Water Board. Walter has been actively involved in a caribou traditional knowledge study in the Sahtu Region since 2006. He was a founding member of the national Learning Communities Network, oriented to understanding the role of communities in resource management. He is author of “Using Indigenous Stories in Caribou Co-Management” (Rangifer, 2012) and co-author of “’Our Responsibility to Keep the Land Alive’: Voices of Northern Indigenous Researchers” (Pimatisiwin, 2010). A professional biologist, Richard was the Manager of Wildlife Research and Monitoring for the Sahtú Region with NWT Environment and Natural Resources prior to his retirement in 2014. 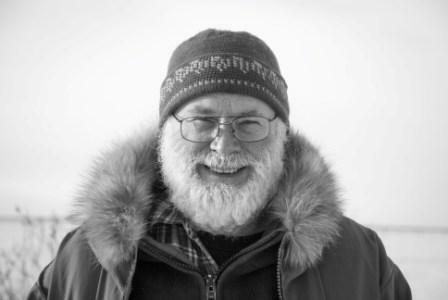 From his roots as a trapper, naturalist, and graduate from the University of Guelph, Richard started his wildlife career with high arctic wildlife research in 1974. His extensive experience in the field of wildlife management stems from his work as a Wildlife Technician, Game Warden, Conservation Education/Resource Development Officer, Biologist, and Manager across Nunavut and the NWT. In 2007, the Fur Institute of Canada presented Richard with the Jim Bourque Award for his contributions to the traditional harvesting economy of the Sahtú Region. Richard remains active in his home town of Norman Wells. Stephanie Behrens is a Wildlife Technician II with the Department of Environment and Natural Resources (ENR) in Norman Wells. Her interest for the outdoors began in high school when she realized she did not want to be stuck in an office job. Stephanie attended the Natural Resource Technology Program in Fort Smith and later transferred to the University of Lethbridge where she graduated with a bachelors in Environmental Science. In the summer of 2012 Stephanie moved to the Sahtú region to work as a Wildlife Biologist Intern for ENR. As a Tłı̨chǫ citizen, originally from Behchokǫ̀, Stephanie feels very privileged to be working with the people of the Sahtú for the common goal of conserving wildlife. Stephanie’s experience also includes working for the Ekati diamond mine Environment Department as a summer student, a Renewable Officer with ENR as a summer student, the Lands Department of the Tłı̨chǫ Government as a Wildlife Coordinator, and several co-op internships while she was in University. These opportunities in the field inspired her passion for wildlife conservation and prepared her for her current job where she spends significant time outdoors, something she continues to enjoy. Her interests also include the importance of using Traditional Knowledge along with the western Scientific Knowledge. As an aboriginal woman, Stephanie takes pride in being able to use both paradigms and she is honoured to have the chance to work with many local hunters and harvesters as well as scientists from all over to collect knowledge that can be used to ensure wildlife will be plentiful for future generations. Dr. Micheline Manseau is Wildlife Ecologist with the National Office of Parks Canada and Associate Professor at the Natural Resources Institute, University of Manitoba. Her primary research focuses on the development of non-invasive methods for the study and monitoring of wildlife populations, on the development of new analytical methods to identify animal population structure and ecological attributes of critical habitat and movement corridors, and on cross-cultural approaches in the management of wildlife species and protected areas. Dr. Manseau works in different regions of Canada and her projects relate to the impact of environmental changes, land use activities and emerging policies. She closely works with the different levels of government, aboriginal organizations and communities and the private sector. For more information on the activities of her lab and students, ongoing research projects and publications, visit her website Landscape Ecology and Community Knowledge for Conservation.